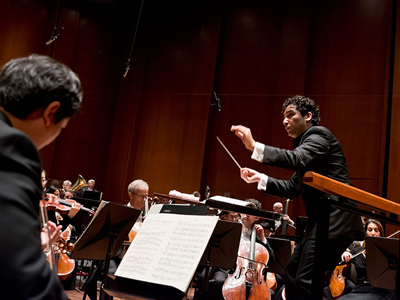 MUNICH — Judging from reports around the country here, the Houston Symphony Orchestra today returns to Texas mission-accomplished. The clarity of its tone colors, the exuberance of its brass section, the articulate luster of its strings — all have been remarked upon during an eleven-day tour to busy German cities (plus Brussels, Vienna and Warsaw) already awash in art music. Last night’s concert in the Gasteig certified the plaudits, although the advance acclaim had not filled every seat. Stronger programming might have helped. Music director Andrés Orozco Estrada opened with the so-called Overture to West Side Story (1956), “a compilation of tunes not made by [Bernstein]” (Jack Gottlieb), when he could have chosen the work’s tense and authentic Prologue and thrown a cleverer light on his musicians. A heavily pregnant Hilary Hahn then meandered in good taste and with pure intonation through the same composer’s conceited Serenade after Plato’s Symposium (1954), unable to do much about its weak structure but sensitively supported by harpist Megan Conley and six astute percussionists. Dvořák’s D-Minor Seventh Symphony (1885) received a brilliantly flowing, sunny performance, with smooth work from the Houston horns and much soft, detailed playing. The Vienna-based, Colombian-Austrian maestro, who learned music at a school next to the rainforest east of Medellín, and first conducted there, will be with the 105-year-old HSO until at least 2022. An ideal appointment, on the evidence. This entry was posted on Tuesday, March 20th, 2018 at 8:37 am	and is filed under Munich Times. You can follow any responses to this entry through the RSS 2.0 feed. Both comments and pings are currently closed.